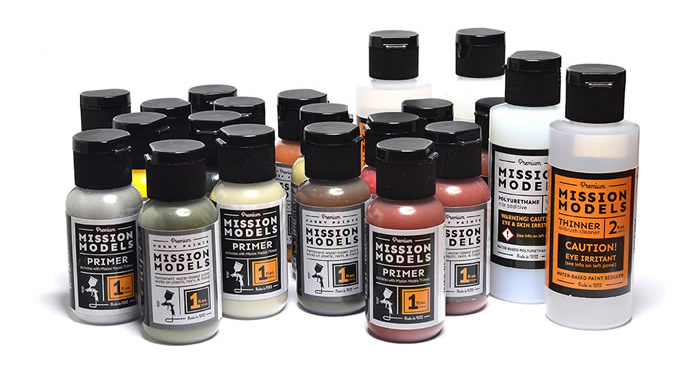 Mission Models has released a new acrylic paint line that aims to be a technological advancement in the hobby industry and a new way to approach hobby painting. Here are the key differences that make it, as Mike Rinaldi put it, a 21st century paint system. It is practically organic: water based, no solvents or volatile chemicals, odorless and it is much safer to use indoors than any other product. It is formulated more like an automotive spray paint than a typical hobby paint. The binder used in this acrylic paint is urethane rather than latex or vinyl. This improves the quality of the paint. The highest quality pigments were used and are very finely ground. The paint is triple pigmented for better colours, coverage and leveling. When dry, the finish is more durable than other acrylics, but you can still easily use the hairspray chipping technique. There are no thinners or additives in the paint bottles that would shorten this paint's shelf life, cause the paint to harden or degrade. The formulation of the paint prevents overspray, spidering and other common air brush problems if you spray at 10-15psi. It is also helpful that all bottles come with a metal ball agitator and that the flip top and dropper nozzle are well designed for one hand use. This is a chemical system because, just like in automotive paints, you have additives that can be mixed with the paint for specific results. This is important, the paints work best when you use Mission Model Paints (MMP) components and pay attention to the ratios. In the case of the primer you have to mix it with the MMP thinner. 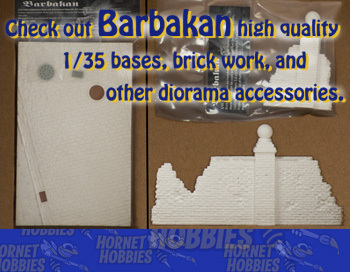 The paints are airbrush ready, but benefit from the use of the thinner and poly mix. The paint may seem to be thicker than what you are used to, but that is normal and will spray very well without plugging up or tip dry. The thickness is the result of the large quantities of ultra fine pigment. You may find some colours to be slightly thicker than others due to the natural properties and minimum grain size of the various pigments. The MMP Thinner is actually a reducer that can also be used as an air brush cleaner. You will use a lot less than what you are used to in other acrylic paints: 2 or 3 drops thinner to 10 drops of paint. The Primer is smooth and durable and you may find that no sanding is needed. Very Important: For the MMP primer to work it has to be activated by mixing in MMP thinner. Follow the recipe: 2 or 3 drops thinner to 10 drops of primer. It will look a little thick, but that is intentional and correct. The MMP acrylic Polyurethane Mix Additive is an automotive grade additive and an integral part of this system. The poly additive is beneficial as it increases flow , lowers drying times , added leveling , increased blending when brush painting, durability and adds a slight eggshell finish. Add 1 to 3 drops max. The more you add the slower the drying time and the shinier the eggshell finish. MMP primer will only work if it is mixed with MMP thinner. Without the thinner the primer will not activate. After mixing MMP paints/primers should look thicker in your air brush cup. The best thinner ratio to start with is 2 or 3 drops thinner to 10 drops of paint. You can test larger amounts of thinner, but you may find that the paint goes on too watery, not cover as well, might pool or run and the drying time will be quite long. Use the same 2-3 to 10 drop ratio for the primer, though it may be more forgiving of higher thinner ratios. Some reviewers found that a 50% (1:1) ratio worked for them - test first! When mixing components we highly recommend stirring the Poly and Thinner into your paints. DO NOT shake. You can try adding more thinner, though this is not recommended by the manufacturer. Be careful of using liquid masks that contain ammonia directly on the paint, it may discolour or even lift off. You may need to seal before using products that contain ammonia. The bottles can dispense precise drops if you cover the nozzle with your thumb, turn the bottle completely upside down (creates a vacuum effect in the bottle) and then squeeze out a few drops.